Back in 2006, Wizards of the Coast published the first set of Dungeon Tiles. For me, this was one of the best RPG products out there…system neutral, great looking, and very durable. At pretty regular intervals, new tiles came out and I was good and hooked. Sometime shortly thereafter, a java based tile editor was published in order to help make maps from the tiles. The dungeon_tiles group on yahoo was started around this time as well. The mapper was decent…you could manage a few sets, and arrange the tiles to make maps in the window. There was even an export feature that allowed you to send a text string to someone else to share your work. But it had limitations. Tiles didn’t rotate by themselves, so the mapper had to store an image for each side, rotated in the four directions. New tilesets (which were coming out at a regular pace) were a pain to add. Most importantly, it wasn’t maintained by the developer. There were a few bugs, and no real way to address them. So, around the middle of 2009, I started teaching myself the python computer language, and started work on a new program to address some of the mapper’s limitations, and to put new features into play. Thus, pymapper was born. 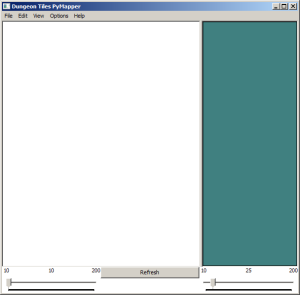 The first pymapper was pretty simple. 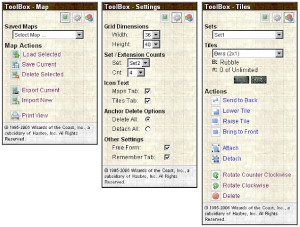 It could create and open tilesets, and the drag and drop from tile window to map window was there. Zoom controls were in place, but not much else. There were no keyboard shortcuts, no toolbar, and few other options. Unfortunately, what it did have was plenty of bugs. To be expected, of course, but it did test the patience of the first users. Welcome to pymapper! Let’s go make some maps!